Today’s guest post is by Dr. Sanjida O’Connell, a literary author based in the UK. Her latest book is out in paperback, Sugar Island. The Literary Novel. We all know one when we see it, although deciphering what it is or telling someone else how to spot one is problematic. In a tautological definition, literary works are often defined as those that win literary awards, such as the Booker Prize for Fiction. Which would rule out any novels written before 1969 being classed as literary. Another definition is that this type of fiction is “writerly”—clearly nonsense since every book is, by definition, writerly—someone wrote it, after all! Recently a number of critics, publishers and publicists have suggested that literary fiction is simply a genre, like crime or chick lit and should be marketed as such (to ever decreasing readers, according to April Line in her guest post here, Why Isn’t Literary Fiction Getting More Attention. I am defined and marketed as a literary author, although I have never won the Booker. I didn’t set out to be in this genre, but now 15 years since the first of my four novels was published, I’ve been wondering exactly what it is that makes a book literary. First, for me, is that it should be Intellectual. A literary novel is about ideas. It has an overarching theme distinct from the narrative and a leitmotif running through it. The theme of my first novel, Theory of Mind (perhaps too densely cluttered with ideas), was on the nature of empathy viewed through the prism of a young boy with Asperger’s syndrome, a sociopathic boyfriend, a robotics expert and the emotional life of a bunch of chimpanzees. Linked to their intellectual side, I think literary works have Depth. Of course, novels with great plots usually have sub-plots too, but I’m talking about the interweaving of ideas, themes, plot, and sub-plots. My third novel, The Naked Name of Love, took me ten years from concept to publication and that, plus the Big Ideas (God, evolution and love), helped give it depth. My fourth, Sugar Island (out in paperback this March), was written much more quickly and I believe it has less depth. It wasn’t just the time it took to write but also the themes. Sugar Island deals with slavery, with freedom and free will, and because as a society we find slavery abhorrent, there is perhaps less to explore since the issues are so much more black and white for us than they were at the start of the American Civil War. Critics often say that literary novels are about Character and commercial “mainstream” fiction is about plot. This seems a bit of a simplification. I do think literary novels should have fantastic characters, but the best books all have fantastic plots too. For me, in a literary work, the plot stems from the characters. The main character behaves in a particular way because that is who he or she is and it is their key character traits that drive the plot. Thrillers, for instance, can often have a plot that is external to the character. I’m exaggerating, but in this genre almost anyone could be the “hero” and go through the same process. Dan Brown’s The Da Vinci Code is a classic example of a pulse-quickening, page-turner, but would seeing into Robert Langdon’s soul help move the plot along? And last but not least is Style. I think we all expect a classic novel to be written in such beautiful prose it makes you want to weep, pause and stare at the sky or feel the words rolling through your mind like pebbles smoothed by the sea. Again, this is not to say that novels in other genres do not need to think about style but the prose can be more workman-like if plot is the driver. Take Stephanie Myers’ Twilight Saga. Supremely popular, these books do not fit into the literary fiction category. They do have interesting characters, they contain ideas (about the nature of vampires and vampire-human hybrids), they reference literature (Tennyson, Wuthering Heights, Romeo and Juliet), but they are predominantly plot-driven, the prose is on the workman-like side, the characters are not deep and the books lack depth. They’re still a great read. So what I’m saying is literary books are not better than any other type of book and elements of what makes literary fiction literary are found in most novels. But if literary fiction is what rocks your world, then go for Wuthering Heights. Posted in Writing Advice and tagged literary definition, literary fiction, literary novel. Dr. Sanjida O’Connell is a writer based in Bristol in the UK. She’s had four works of non-fiction and four novels published: Theory of Mind, Angel Bird (by Black Swan), The Naked Name of Love, and Sugar Island (John Murray). Thank you! Very insightful comments. Where I get stuck is exactly with your last comment, how challenging to make a piece of writing. My tendency is not to explain too much but let the reader work it out herself – readers are intelligent, right? But publishers seem to want more explanation to make the work accessible to a lower reading level and therefore more commercial. I get confused by the term every time I hear it, it sounds like it’s doubling up on itself. But fair enough, I think I get where you’re coming from. I don’t think it’s a matter of whether or not it’s better than other genres in writing, because let’s face it; the bottom line is whether it is an individual reader’s preference, and whether the individual book is written to that reader’s taste… right? But I guess novels that are ‘literary’ may be more likely to stand the test of time. I’m thinking of novels that we view as ‘classics’ now but may not have been viewed as literary when they were written, e.g. Dickens; Austen. We’ll just have to hang around a few more decades and see what’s still in print…! This is a wonderful article. Thank you for defining a genre that is a mystery to many but a joy to those who write within it. Cheers! I have written what I believe to be a literary novel, but is is published by a genre publisher. So one element that you miss out of your definition of what is considered “literary” is that a publisher has not labeled it as something else for marketing purposes. That’s true. I’ve been told by my publisher that they don’t like publishing books that could fit in more than one genre so tend to choose the genre they want to market the book in. So kind of you, Jean. Thank you. It is refreshing when one thinker can, so distinctly, clarify for us essentials that we can sense but not distill into words. Currently, I am working toward a PhD, but I have an MFA in Creative Writing and I taught English for years; in the interim, I have written four literary novels–and I am surprised every time when someone says, “What’s that?” Perhaps the next time a fellow teacher or a learned friend who is not familiar with the term, let alone its components, asks me I will have an able answer. Thank you, that’s very kind of you. It sounds as if you are far more qualified than I am to comment as I didn’t study English past age 18. Seems to me that “literary” is just another genre. Fabulous breakdown of what makes a literary novel. I’ve heard the character thing before as well, but I think you’re four pillars make a lot of sense. Yes. That says it well. That remains my goal; to write literary fiction. Thank you. Good luck with your writing, Cherry! This makes me so happy. Thank you, Sanjida. Aw, you’ve made my day! Thanks! I’m not convinced that ‘literary’ novels are necessarily more likely to stand the test of time, or become ‘classics’. Is Dracula a literary novel? Or Frankenstein? What about Journey to the Center of the Earth? This may be a simplification, but I tend to agree with Stephen King’s reassessment that literary novels are about extraordinary people in ordinary (real-life) circumstances, and genre novels are about ordinary people in extraordinary circumstances. Terrific post. You do a great job highlighting some of the components of literary fiction. I also think literary fiction is about depth and subtleties. 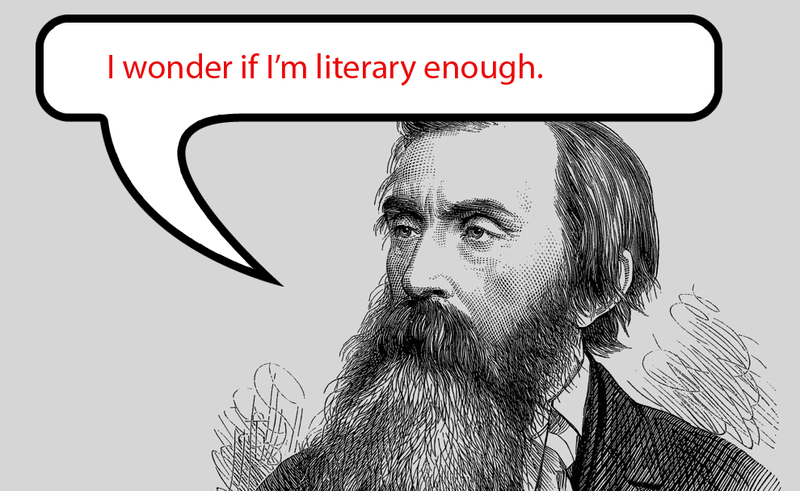 Do you think literary fiction is making a comeback? With self publishing, do you think ‘genre’ fiction will push literary fiction further into obscurity? Wow, what a terrific question. I have a feeling, sadly, that self-publishing may well push literary fiction further into obscurity, as you say. If you look at the people that have self-published and then been picked up by publishers, they tend to be writing thrillers or fantasy, not literary fiction. I think literary fiction has been difined by its wholeness in covering all the elements mentioned. It has unfortuneatly also been married with erudite snobery for many years, making the young reader standoffish. I agree. When I was growing up I didn’t read any classics because I didn’t see why they were ‘better’ than the books I was reading. They also seemed to be ‘establishment’. I changed my mind when I read Wuthering Heights and Jane Eyre. Now I would consider myself a very eclectic reader. I guess encouraging younger readers to read anything – and then introducing other genres they may not have read yet – may be the way forward. This is a definition that works for me if Jessica Kent’s comments about challenging the reader with words and inspire the reader with it imagery are added to the mix. Loved your phrase “feel the words rolling through your mind like pebbles smoothed by the sea”. It conveys the effort and time it takes to craft and shape words that touch the soul. Thanks for a thoughtful and thought provoking blog. One thing I enjoy about what I think of when I think of literary fiction, is those authors are given increased leeway in developing plot. It doesn’t have to pound down the road or match a metronome in 6/8 time. It feels like greater latitude to spend time with descriptions or characters providing more depth of experience for the reader. I think you’re right, Christina. When I read books about writing, like ‘The Writer’s Journey’, they seem quite formulaic and almost as if encouraging you to translate an action film into a novel. What’s so great about novels, as opposed to movies, is the interiocity – if that’s the right word. Stuff going on in your characters’ heads! And, as you say, you have more leeway to develop this aspect in literary fiction. Well, that’s a shame isn’t it? It means that sci-fi readers are probably never going to read Margaret Atwood and Cormac McCarthy so, in my view, the publishers are doing themselves and writers both a disservice. Readers become better readers when they’re challenged. They also become more active and engaged readers. They begin to read more widely and venture outside their favourite genres. So, all in all, the way publishers are classifying and marketing things is really not working for anyone except their shareholders in the very short short-term. Yes! I agree literary work can be very poetic. Two contemporary writers I love, Tobias Hill and Anne Michaels – and, of course, Charlotte Bronte – are also poets. Good luck with finding a community – let me know if you! I think I have learned more from this thread than from any textbook! Thank you so much everyone. I have always considered the genre in which I write to be literary fiction and all these comments gladly confirm it for me. With my novel currently topping the Literary Fiction Review (Kindle) ranks on Amazon UK I am very pleased that my initial thoughts on literary fiction appear to have been confirmed! Phew! There have been some really interesting comments, perhaps we are having a literary revivial after all. Thank you for your comment and well done to you! Thank you! I agree! If anything I don’t feel quite so alone. It can be quite scary out there amongst the zombies and the vampires even if there are child wizards around every corner just waiting to save you! That was very spot on, thank you for the article Sanjida! Kafka, Austen & Burroughs were just writing fiction, not literary fiction, not romance/SciFi or whatever one might try and categorise Kafka as. To me the indictment is the labelling of any book with a genre, it diminishes reader, author and book alike. Literary fiction seems to me to be that genre that scoops up all the books that can’t be pigeonholed in the other genres. As some of your correspondents have written, scifi in particularly can meet all of your criteria. I don’t know. I recently re-read Wuthering Heights. It’s a junk novel, IMO. NANOWRIMO: Planner or Pantser? It doesn't matter... FIGHT to WRITE !